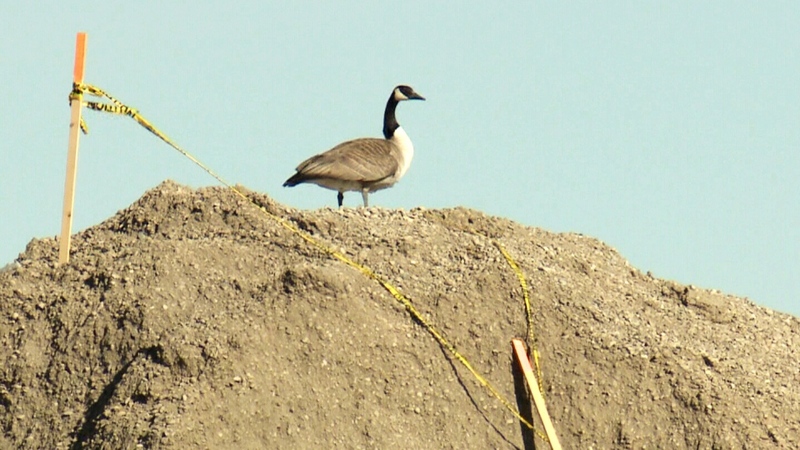 A pair of Canada geese are playing king (and queen) of the hill in Lethbridge, Alta., where they've halted construction at a future business park by nesting on a pile of gravel in the middle of the site. The geese have laid eggs in their nest and are now legally protected under Canada's Migratory Birds Regulations. That means workers will have to avoid the nesting site until the eggs hatch and the goslings fly away with their parents. Western Tractor president Steven Dyck says workers have put up caution tape around the nest and are working around it while they finish construction on the site of his future business. "We took as much gravel as we could but we left that there so she could have her babies, hatch her babies and hopefully move them down to the pond and we can get back to business," Dyck told CTV Lethbridge on Sunday. The gravel pile sits where the machine factory's parking lot will be, so Dyck isn't too concerned about the hold-up. Still, he says he looks forward to the goslings hatching and moving on so the project can be completed. "You plan just as much as you possibly can and try to think of every scenario in the book, but we didn't plan for this one," he said. Canada geese nest in the same location every year and lay eggs that incubate for about 25 to 30 days. Workers noticed the eggs in the nest last week, so it could take up to three weeks for them to hatch. Dyck says workers have dubbed the hill "Goose Mountain," and are looking forward to the birds hatching. 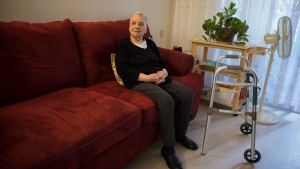 "We're all anxiously waiting for the arrival of the little goslings," he said. The site was a farmer's field before construction began on the Western Tractor machine factory. A Canada goose is shown on top of a gravel mound at a Lethbridge, Alta. construction site. 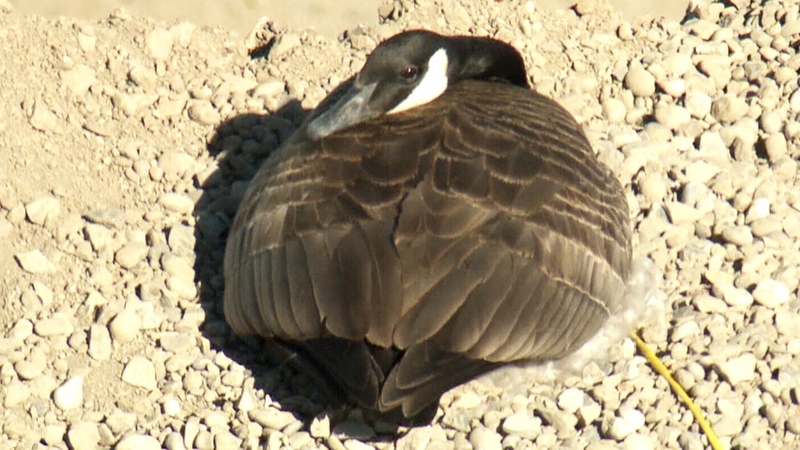 A Canada goose is shown in its nest on top of a gravel pile in Lethbridge, Alta.